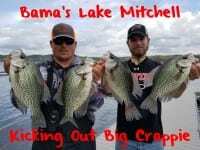 After a slower March, April has turned out to be a banner month for big crappie on Kerr Lake. The water warmed up and we are catching large crappie up to three pounds. For the last two weeks we’ve averaged 25-30 crappie caught over 10 inches a day. Our continued success will be a reflection of water levels. If the water level stabilizes or doesn’t go down or rise (which is a big key) then the crappie get in a zone and stay there. Fluctuation is one big fight that everybody complains about on Buggs Island or Kerr Lake. It hurts the fishing. Monitoring the fluctuation of water levels is important. It affects the fish because they move one way or another if the water rises or falls. Right now the big fish bite is great, but catching 50 to 60 a day isn’t in the program yet. The bite was slow a few weeks ago, but the water has warmed up and they are biting better. However, they are running a ton of water. Lake managers dropped water levels two feet in 10 days. 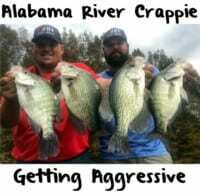 To the crappie is a scary situation. They don’t want to stay on the bank in the shallow water and drop their eggs. Instead, they move back out a little bit deeper to where they are more secure. And, you also have to take into consideration that all crappie do not spawn at the exact same time. They are still scattered. The crappie that are ready to spawn are afraid of the water dropping so they pull back out in deeper water to spawn. There’s been other crappie in the shallows that are eating minnows and shad and while those fish are not ready to spawn they also pulled back out when the water was dropping. This is because the shad and minnows pull back out and that’s what the crappie feed on. This is what happens when the water is on a falling stage. We need it to stabilize. We are catching crappie now in eight feet all the way out to 20 feet of water. However, the crappie are roughly 7-10 feet below the surface. It does take time to figure out exactly where the schools have pulled out to. This is an experiment you need to try every morning. It’s best to rely on your electronics to search for them. I’m still long lining for them. It very important to note that this time of year if I’m going to stick with a 1/16 ounce Road Runner I have to vary my speed throughout the day to see what they want. If you are running 1 mph with 75-100 foot of line out your jigs are running around five feet if your rod tip is close to the water. I always run a few standup rods that are pointed upwards, too. That makes those jigs run a foot to two feet shallower. I recognize which rods are getting the most bites and adjust. If the standup rods are getting the most bites I need to increase my speed for the down rods to raise them up in the water column. Or vice versa. I’m long lining with six-pound Suffix Elite High Vis yellow line and running 1/16 Road Runner heads, some with round blades and some with willow blades. I’m experimenting each day with colors of the grubs I’m putting on them and I definitely tip every jig I’m pulling with a live Chartreuse Fire Dye minnow. I think that’s making a big difference. There are certain times especially Saturday and Sunday when I’m in the mix with 20 boats and we are constantly catching crappie and boats around us are struggle. It’s the dye. Crappie love chartreuse minnows. Ask my clients. We don’t put a minnow on that isn’t chartreuse and I wouldn’t do it if it didn’t work. I have to get up 45 minutes earlier every morning to what I call ‘cook’ minnows.